Our prices include a Full Scottish breakfast, using local produce when ever possible, consisting of sausage, bacon, egg, black pudding, potato scone, mushrooms and tomatoes toast, tea, coffee or hot chocolate. A selection of cereals, yoghurts, local cheeses, fresh fruit, fruit juices, porridge, fresh rolls and croissants are also available. We also cater for vegetarians and vegans. 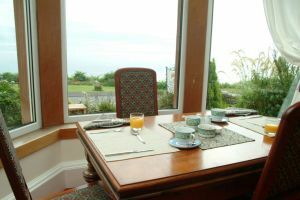 Eating out on Arran has a lot to offer: from formal restaurants to fish n’chips, you can find something for everyone. Whiting Bay offers : the Trafalgar, one of the best on the Island, Coast Bistro, one pub: Eden Lodge, who serve fine Bar meals, and a tearoom, the famous Coffee Pot. More places can be found in the neighbouring villages of Kildonan (Kildonan Hotel) and Lamlash (Glenisle Hotel, Pierhead Tavern which is the brewery “tap” join us for some of our beers or enjoy beers from all over Scotland both serving excellent food), also the Pier Tea Room, as well most other villages have plenty to offer. In Brodick the largest village on Arran We especially recommend the Kilmichael Restaurant, Arran’s only 5 Star hotel and restaurant (closed during the winter), the Eighteen69 restaurant at Auchranie resort, We also recommend you try the Lagg Hotel in Kilmory, the Lighthouse Tearoom in Pirnmill and the Kinloch Hotel in Blackwaterefoot. We can help you choose and book a table, just ask for assistance. In Lamlash we have the Pierhead Tavern which is the brewery “tap” join us for some of our beers or enjoy beers from all over Scotland. There is also the Drift inn where you can enjoy our beer. In Brodick we have The Ormidale. The Ormidale Hotel is a lively pub with 7 bedrooms, famous for its home cooked bar meals , real ale and weekend discos.